What’s a party without a game? 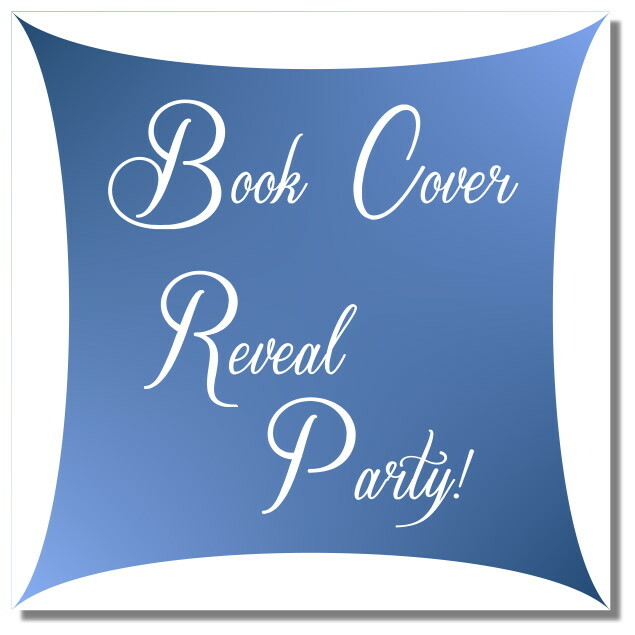 In this game you will hop from one blog to the next, finding the clues and when you think you have the answer, go back to Morgan Dragonwillow’s post, Soul Prompts Book Cover Reveal Party, and put the answer in the comments. The first person with the correct answer will win a signed copy of Soul Prompts and a $10 Amazon gift card. Have fun! Where in the world is one of my favorite places to sit or walk and connect with the source of creation and to remember we are all one? Good luck but most of all have a great time! I am pleased to reveal the cover for Soul Prompts: Finding and Hearing Your Inner Voice. Soul Prompts is a spiritual writing experience that gives you a direct line to the source of inspiration. If you could communicate with your soul would you? If you could hear what your soul’s plan is for this life, would you want to hear it? What if learning to communicate with your soul could help you get your words on the page? Soul Prompts will help you connect to that voice within whether you want to have a deeper spiritual life, a better understanding of your purpose, discover which path to take next or to help you get your stories written. Are you open to the possibilities? It’s time to have a conversation with your soul. Take your writing to a deeper level. Explore your connection to your soul. Live a more spiritual life. Have a better understanding of your writing journey. Figure out your next step. Discover where your words come from. Learn why your soul chose this life. Soul Prompts: Finding and Hearing Your Inner Voice – Paperback and ebook – coming out this October! Morgan Dragonwillow is a poet, survivor, lover of all things magical, dancing with words, recovering perfectionist, and indie author that (mostly) doesn’t let her fears get in the way of her passion for writing and creating. She is team leader at @StoryDam and creatrix of #OctPoWriMo. She lives in Marietta, Ga. with her loving and patient partner, their dog that thinks she’s a princess, and the cat that reminds her that she isn’t. This beautiful cover was created by the artistic and wonderful Andrea Moore! Working with her was a pleasure and she was very patient with my questions and suggestions until we were both happy with the results! If you are working on a book and don’t have a cover yet, I highly recommend you have a chat with her! Andrea Moore grew up in a town so small, on top of a marsh, that the mosquito was considered the city bird. She uses her degree in computer graphics and her artistic abilities to sprinkle joy throughout local consignment shops and EtsyEtsy. Andrea is now breaking out of the box further as she explores the adventures of book cover creating. A writer’s retreat in South Bohemia- who wouldn’t want it? Oh to have a writing retreat such as this, to inspire and nurture the imagination – am I allowed to turn a gentle shade of green? I am sitting at a garden table come desk in the corner of the upstairs living room and I am, as you can see, writing. This is where I write all my books. On the wall in front of me are two Javanese puppets and on the wall to my right is a notice board covered with photos and prints: inspiration. There are two images of foxes, my spirit animal, something I share with Bessie a character in my book The Company of Shadows. I regularly see my fox walking the fields and lanes around here or hear him at night barking in the orchards and forest above the house. Also on the board are photographs of my son and husband of course. In the centre is a picture of my friend and mentor, Hannah. She is standing with a large bag over her shoulder, a fox brown scarf around her neck to match her hair. She has stopped, turned slightly and is saying something to me. We have just come from a walk in the forest, where crowds of purple buttercups stood just proud of last year’s fallen leaves. Hannah is the reason I am here in this old farmhouse in South Bohemia. After over twenty years exile in London, Hannah returned to her native Prague and then a few years later left the bustle of the Czech Republic’s capital for a gentler life in the beautiful historic town of Cesky Krumlov. I visited regularly from the UK. I recall the excitement of my first visit – I was intoxicated by the atmosphere of Prague just after the Velvet Revolution, by the sudden burst of energy and joy that filled the air as the Czechs took their first breaths of freedom. I was inspired to pick up my pen and write Fool’s Paradise, the long poem for voices which won the EPIC award for best poetry book last year. Hannah was delighted that Prague should have such an immediate impact on my creativity. Cesky Krumlov had a softer impact but no less powerful. Local people say that it worms its way into you, that once it has hold of you it demands a toll. Some say that it stands on powerful leylines – many Czechs are great believers in such things. But for me the real draw is not the town with its fairytale castle but the countryside, in particular the Czech forests. If you take the path out of my village and walk uphill, you will soon find yourself surrounded by trees. Once the forest contained a quarry, carving out the granite that was used to fashion my house and the other houses in the area. Now there are just fallen rocks, some carved ready to be piled onto carts and taken away. It is as if the workers just downed tools one day and never returned. As you walk you may start a deer from its hiding place or hear a boar shovelling the ground in the undergrowth. In the summer you will find wild fruit – raspberries, strawberries, bilberries – tiny explosions of flavour. In the autumn you will find mushrooms pushing up through the loam. My favourites are chanterelles with their scent of apricots – the Czech name for them is foxes. My village stands on the edge of the Sumava. 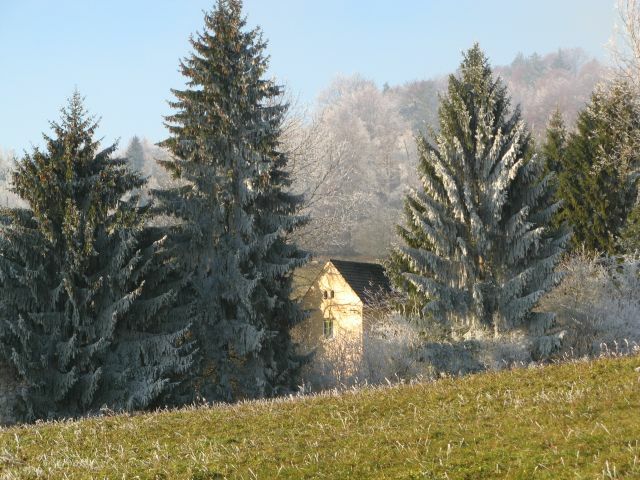 The mundane English name for the Sumava is a translation of the German – the Bohemian Forest. The Czech name is so much better – Sumava can be translated as the Rustling. 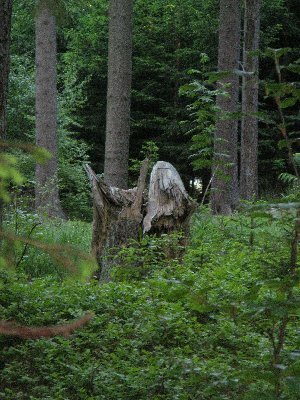 This forest, which extends over the border into Germany, is sometimes called the Green Lung of Europe. For over forty years the Iron Curtain ran through its centre, ironically protecting the animals and plants there from man’s intrusion. 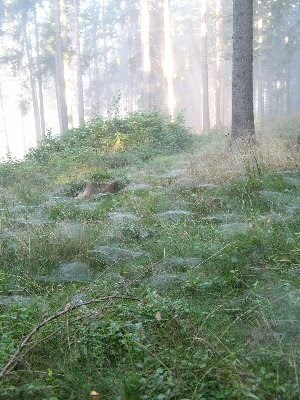 This forest is the forest of the Brothers Grimm and it is easy to see witches and dragons in its undergrowth. In such a forest how is it possible not to be inspired, not to have your imagination buzzing, just like the bumblebees in the forest glades? Encouraged by Hannah, I bought my farmhouse. It is built into the hillside, like a fox’s lair. Indeed the hill is called just that – Fox’s Lair. It was a shell of a building, but had been much loved. I saw it and I too fell in love. The house had a broken roof and rising damp. The previous owners used to open the cellar door and throw in unwanted bottles, broken plates and other such detritus. When the rubbish had been removed we came across a cement floor, and when the cement floor was removed to reveal granite cobbles a spring began to flow. “It’s symbolic,” said Hannah. “It’s just like you. You’ve been repressing your writing, now it will flow.” She was right. When Zoe was a little girl her inventor father taught her to “look at things another way”, while her mother taught her to see dragons in the shapes of natural things. Zoe is still putting into practice what she was taught. In 2012 Zoe published her first novel, Girl in the Glass (the first book in The Healer’s Shadow trilogy). Four books have followed, including the rest of the trilogy and the award-winning poetry book Fool’s Paradise. Zoe aims to write popular books that have complex characters and themes that get under the reader’s skin. She finds her experience of working with people on the edge of society an inspiration for her fiction. 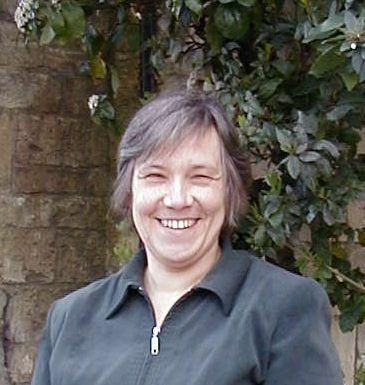 Zoe uses magic realism in her writing and has a magic realism blog, where she reviews a magic realism book a week: http://magic-realism-books.blogspot.com. She also administers the Magic Realism Books Facebook group. 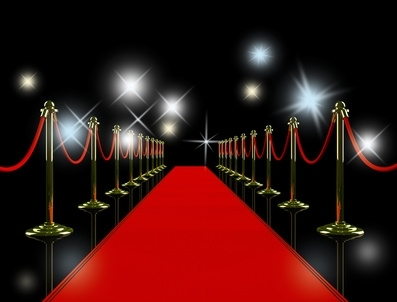 I am welcoming Zoe Brooks on the Red Carpet today and tomorrow; today her trilogy of books The Healer’s Shadow, tomorrow a guest post on the beautiful retreat she has for writing. The trilogy follows the life of Judith, a traditional healer in a world not so dissimilar to our own, from her youth (Girl in the Glass) through her self-education in healing and love (Love of Shadows) to maturity when at last she is able to face both her past and what she could be (The Company of Shadows). Orphaned at the age of 10 in circumstances that she refuses to explain, Anya grows up trapped in the house of her abusive aunt where she and Eva, her Shadow, are treated as slaves. As her aunt tries to break her and the punishments become increasingly life-threatening, Anya struggles to find affection and self-esteem. When the inevitable showdown arrives, where will Anya find the strength to survive and escape? And if she does escape, what then? An arduous walk across an unforgiving desert to a city where an even worse danger lies. In the city of Pharsis traditional women healers are banned from practising and the penalty for breaking the law is death by hanging. After being arrested and interrogated twice Judith is careful to avoid suspicion, but then scarlet fever breaks over the city like a poisonous wave, leaving in its wake the small corpses of children. What will the young healer do? Judith may have stopped being a healer, but she has a loving husband, two boys and a successful business as a perfume maker. She’s content. So why does she keep having nightmares about falling?When an accident throws her life in turmoil, she is forced to leave her home and seek the help of strangers. She must face her darkest fears and learn how to fall. She meets with two women she has long avoided and meets others she thought she had lost. But most importantly she finds herself. I think I am back! Alberta has read 125 books toward her goal of 125 books.